What is it? 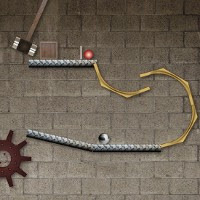 – Dynamic Systems is a physics-based contraption-building game where you’ll need to do your best Rube Goldberg impersonation to get the steel ball into the cup. Who made it? – The game was developed by Lorenzo Nuvoletta. How does it play? – If you’re an avid Flash game player, you’ve probably encountered a number of games focused on machine building or getting a ball to a target destination – or both. (See Go Home Ball or Civiballs, for recent examples.) Dynamic Systems utilizes these tried and true gameplay mechanics to deliver a high-quality 30-level physics-based puzzle game. Each level begins with a certain number of “fixed” machine pieces, and provides you with a number of other parts that you’ll need to place on your own. There are actually quite a few different types of fully-rotatable parts – like gears, bouncing platforms, and swinging hammers – each adding various dynamics to your machine. Once you’re satisfied, clicking the “Start” button will let you see how successful your contraption is at getting the silver ball into the bucket. Presentation – The game sports an industrial look and feel which is a lot like the physics-based puzzler, Collider. The textures are well-detailed, but some might find them a bit drab. The in-game music is an interestingly composed piece of violin music with a bit of percussion, composed by Brian Sadler. It’s a bit short to be run endlessly in a loop, but is a high-quality effort. Positives – The game doesn’t really do anything that hasn’t been done before, but the gameplay is quite solid and there’s a fair amount of it. In cases like this, originality isn’t nearly as important as solid execution, and the whole experience is polished and fun from beginning to end. As I mentioned before, I really dug the music too. Negatives – Given the amount of control you have with regard to part rotation and placement, you may find yourself doing a lot of incremental adjustment to parts of your machine, especially during some of the more intricate levels. That said, the experience would probably be too easy without that level of control. Why you should play it – Dynamic Systems is a solid, polished, and (more importantly) fun game that doesn’t reinvent machine-building or ball-physics games, but still manages to deliver a very gripping puzzler with some well-designed levels. It’s definitely worth some of your time. Great game! I didn't realize Ponged had a blog until just now.